We finally have a non-MLB ballpark sticker on the car. We had been hoping to have a sticker on there by now from Disneyland or the National Park, but the Field of Dreams was the first place we found one to put on the back of the car. It is a blue bumper sticker style one with the words Field of Dreams Dyersville, Iowa. At the Field of Dreams they had a black or natural color as the choices for the mini bats. Mik refused to get out of the car, but he did eagerly make the choice between the two options when I asked him. He went with the natural one, which he tends to lean towards often. The mini bat has a pretty simple design that says Field of Dreams Dyersville, Iowa in black lettering. Miller Park impresses with its accessibility in the parking lot, but the accessibility soon turns not as great. The handicap spots are located in one of the Premier Parking lots, but you only pay $8 like in the general parking lots compared to $15. Be sure to mention this when you are at the pay person, as they were too distracted to notice that we had the handicap placard up, but as soon as Dad asked where the handicapped parking was she said parking was only $8 instead of the $15 she had first asked for. The parking lots are largely used by tailgaters and thus there are port a potties in several locations including at least one that is wheelchair accessible. Getting into the park is also quite easy, as you can go through any gate and pretty easily be next to a turnstile at the end of the row that has a way of letting you pass to the side of the turnstile. 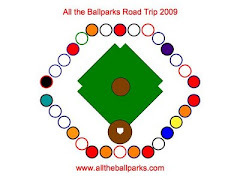 So many parks have you go through a specific entrance or the rows of turnstiles are long and require major walking around if you accidentally end up in the middle, such as we have done several times at the Dbacks in the past. The first thing that I found not very accessible was the Team Shop. It seems most retail shops do not care to make their displays far enough apart for wheelchairs, but this one was by far one of the worst team shops to navigate through and it certainly did not help that it was also one of the most crowded with people. We mostly just left Mik in one spot while we searched for things like the stickers for the car because it would have taken forever to try to do it with Mik. The seats we had in 442 were not too bad handicap seating wise. Sure there is the issue of the stupid mascot clubhouse, but that is an issue for everyone in the section. The bar in front of the handicap row is at a good low height to not block the sight line. However, the bar is really close to the seats and even me with short legs felt crowded up next to the bar. Also, annoying was we had 1, 2, and 3 and the only way into 1 and 2 was to come through spot 3, which was where Mik had to sit in his wheelchair. Such annoying planning to have to move the chair everytime we wanted to get in and out. Not quite as bad as the Metrodome, but still annoying. The worst thing about Miller Park is the ushers. The one in our section was mostly absent, but he would come back every inning or so to kick people out of the section next to us that had been closed off because of a roof leak that caused there to be water in the section. It seems like that is the sort of time they should have been more present in the section. The worst, though, was when we were riding the elevator. When we went up to our seats it was not too bad and the usher was not too bad, but still he did not exactly stop a group of 8 just going to suites get on and almost having another wheelchair person have to wait for the next elevator. Those fans were polite, though, and we all squeezed in to accommodate the other wheelchair. The ride down was way different. There was a crowd of people in front of the elevator and only us and one other wheelchair person. The usher allowed the very able people crowd on and did not care at all when Dad approached him and pointed out there were two wheelchairs that needed the elevator. He allowed us to squish in and then three more fans decided to squish in as well. The door did not close at first and he did not even care to ask them to get out, as they had rushed in after he said the elevator was full. They just squished in some more. The other group with the wheelchair was forced to wait for the next elevator. I do not mind waiting for our turn, but these people were rude and could very easily have taken one of the many escalators or staircases down. I just could not believe how the ushers did not even give the wheelchairs priority, which every other ballpark does including often them pulling us out from behind several other groups to be the first to get on the elevator. Sure, you get rude fans everywhere, but usually even the fans make sure that they do not get on before those that actually need the elevators. Basically it seem many of the ushers were rather lazy. The Brewers Team Shop was kind of disorganized. Okay, the stuff was on the shelves and where it all belonged, but it was not organized by like stuff very well. This was especially the case when it came to the stickers. Dad found several in one area including a rather tiny reflective one. We almost got a big player one that came with a separate logo one, but we finally located the regular Brewers logo one. At the Brewers’ I found a ballpark baseball for their Miller Park. The baseball does not have that interesting of a view of the field, especially since the Brewers logo is over the image. However, it does have a pretty cool and intricate Miller Park logo on one side. Another side also has the Brewers logo just on white. At the Brewer’s Mik chose the dark wood natural bat. He has some natural wood bats, but none of them are dark wood like this one. The logo on it is the Brewers logo with a baseball behind the larger Brewers name. Today on the way to Denver we took about an hour and a half detour to go by the Field of Dreams in Dyersville, Iowa. It was not a long stop, but it is was worth it. Mik has been in full pill mode again and has been complaining about stopping here ever since we rescheduled it from Sunday to today. We just let him stay in the car since it was not worth his complaining to make him see it. The field is not much, but it is kept like the movie and the house in the movie can be seen from the outside. The only real difference was the corn was currently not high due to the time of year. Mik actually noticed this from the car and thought they no longer grew corn and that ruined the whole thing, but the corn is there just not high yet. They also had a good gift shop where we were able to get a mini bat, a souvenir baseball, a postcard, and a sticker for the back of the car. Overall a short stop, but it was worth going out of our way and finding a way to put it back in the plan. However, I think it might not have been as good if we went more out of the way to see it from St. Louis to Chicago than the way we ended up doing it.